Quite simply, Shelby County has one of the more successful school systems in the State of Iowa, academically, athletically and otherwise! We are among the state's leaders in combining a top-quality academic education with a wide variety of successful extracurricular activities. Our students test in the top percentiles, with a U.S. Department of Education 1013-15 National Blue Ribbon School award and also have unprecedented success in marching band, jazz band, FFA, STEM and mock trial as well as 27 athletic state championships. In 2014 over 70% of our graduates were attending post-secondary study and had access to over $200,000 in local scholarships. Students not only excel at in-state schools but we also have students who attended Baylor, Cornell, Northwestern, Notre Dame, Rice and Stanford. Constructed in 2003. 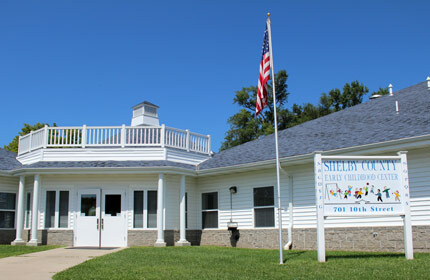 This facility houses Shelby County Head Start program, Child Care Resources and Referral, and Little Cyclone Preschool. The building connects to Time for Tots and they share meal preparation and inside play space. Iowa Child Care Resource and Referral is a community based organization that lends a helping hand to people who care for and about children. Iowa CCR&R provides a wide variety of services for: child care programs, community, employers, and parents. They work to improve the availability, affordability, and quality of child care. Due to the uniqueness of child care needs, they provide guidance by phone, in person, via the internet, and in other ways that are tailored to you rather than a one-size-fits-all solution. They maintain a full list of home-based providers for families looking for that service. This is a comprehensive early childhood development program serving low-income children from age three to five and their families. Head Start is a Federal program that is operated by a local non-profit organization – West Central Community Action (WCCA). Children who attend Head Start participate in a variety of educational activities including literacy, language, science, social-emotional, and much more. They also receive medical and dental services, have healthy meals and snacks, and enjoy playing safely indoors and outdoors. In addition to the educational services provided by Head Start, family involvement is at the core of its success. Head Start families can take part in the classroom as a volunteer, help with classroom projects, and even help develop curriculum. 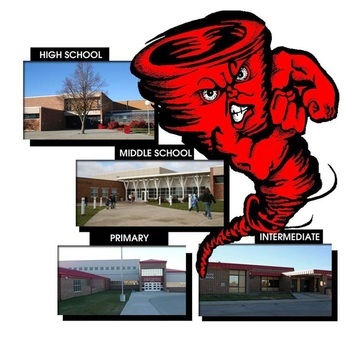 This is a Harlan Community School District run program. The mission of the Little Cyclone Preschool is to provide every student in the program with a quality, research-based, comprehensive curriculum, which is adapted to meet the individual needs and goals of both the special education students, and their general education peers. Preschool students learn best through meaningful hands-on play experiences. Thus, the Cyclone Preschool utilizes developmentally appropriate learning centers as well as small and large group instructional practices to teach pre-academic skills in language arts, mathematics, science, and the social sciences. All students involved with the Little Cyclone Preschool gain from their experiences with peers. The general education students, as well as their special education peers, learn, grow, and play side-by-side in a caring, nurturing environment. This two-story 6,200 sq. ft. facility was built in 1993 and is a licensed child care. It has the capacity for 125 children (newborn to age 5) and employs 45 staff. The staff is certified in CPR and Red Cross first-aid training, and must complete at least six hours of child care training per year. The ADA-approved facility includes playgrounds for infants and older children. Preschool programs provided for children ages three to five. Services for school children through age 12 are available before and after school, non-school days, and summer. Find us on FaceBook. Constructed in 2005, this single story 4,000 sq. ft. facility is a licensed childcare provider for children 6 weeks to 12 years of age with preschool for 3 and 4- year olds. The facility has a capacity for 92 children and has a staff of 28. The staff is certified in CPR and Red Cross first-aid training. Children have age appropriate toys, nutritious meals and snacks under the State of Iowa Child Care Food Program, hands on activities and various field trips throughout the year. Kountry Kids is located at 200 12th Street, Harlan, and operates Monday through Friday 5:30 a.m. to 6:30 p.m. 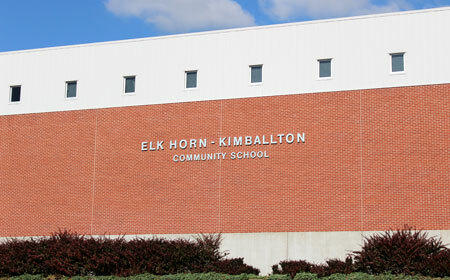 The Elk Horn-Kimballton School currently serves 254 students grades K-12. The district enjoys very solid support from its parents and community which help it provide a safe and secure environment. The district is currently emphasizing technology which has resulted in three computer labs, mobile lap top cart with twenty five computers, wireless network throughout the building, at least one computer in every classroom, and an ICN site. Student achievement scores show that 80% of students are proficient in Math, Reading and Science on the Iowa Test of Basic Skills. Students have access to a variety of extra-curricular, co curricular fine art opportunities in grades 5-12. High School students are able to receive college credit through Iowa Western Community College by attending classes at the Rolling Hills Academy in Atlantic. School facilities are outstanding and the financial status of the district is sound. Harlan Community Schools is a PreK-12 public institution that draws over 1,600 students. The school district covers 279 square miles and includes the communities of Corley, Defiance, Earling, Harlan, Jacksonville, Panama, Portsmouth and Westphalia covering the majority of Shelby County, Iowa. We believe that high expectations coupled with a strong work ethic have built a strong academic and extra-curricular tradition within the Harlan Community School District. The district employs some 200 education professionals and has an annual budget of over $18 million. The facilities are excellent, highlighted by the opening of a new Primary Building (K-2) in the fall of 2010. Individuals interested in reviewing the outstanding educational offerings may check standardized test scores at the Iowa Department of Education website. That research will reveal test scores that are among the very best results in the entire state. Harlan Community Schools also offers a full slate of co-curricular activities, led by a jazz band that has won the State Jazz Band Contest the past three consecutive years, a FFA program that is the largest in the state, a football program that has won more state championships than any other district in the state, and many other equally successful vocational, athletic, and fine arts programs. 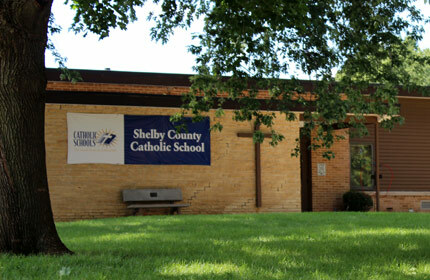 The mission of Shelby County Catholic School is to nurture faith, encourage intellectual growth, and inspire commitment to community by ensuring a distinctive, Christ-centered learning environment.